The sheer audacity of you! That is what I said to her as if somehow she’d understand my ire with her inability to “drop it”. When Simon’s cuteness outweighed his bad behavior. His horns took a while to knock off his halo. I’ve found that holidays or rather any special day always happens to be just a little more special now that I have dogs. I know, it may sound silly, and perhaps, that I spend too much time with my dogs, which on some days is most definitely true. Lately however, I have discovered that any celebration is infinitely more exciting with dogs. 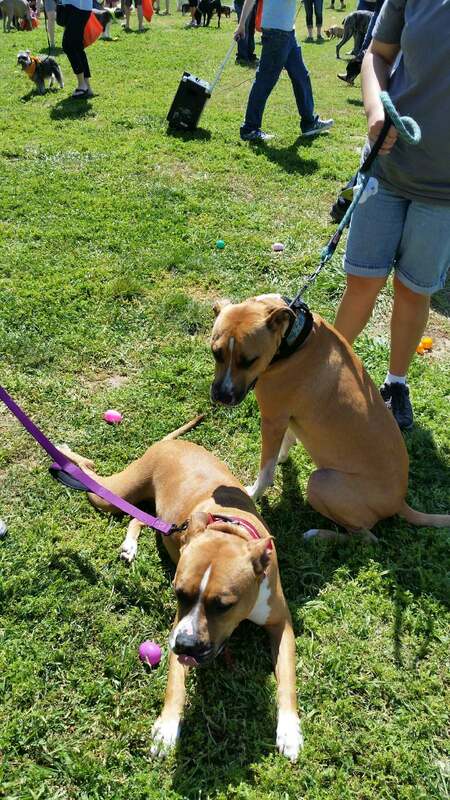 Today was one such day since it was Easter, and it truly went to the dogs. Don’t be fooled by Simon and Rosee’s relaxed poses here, they were egg-hunting machines. 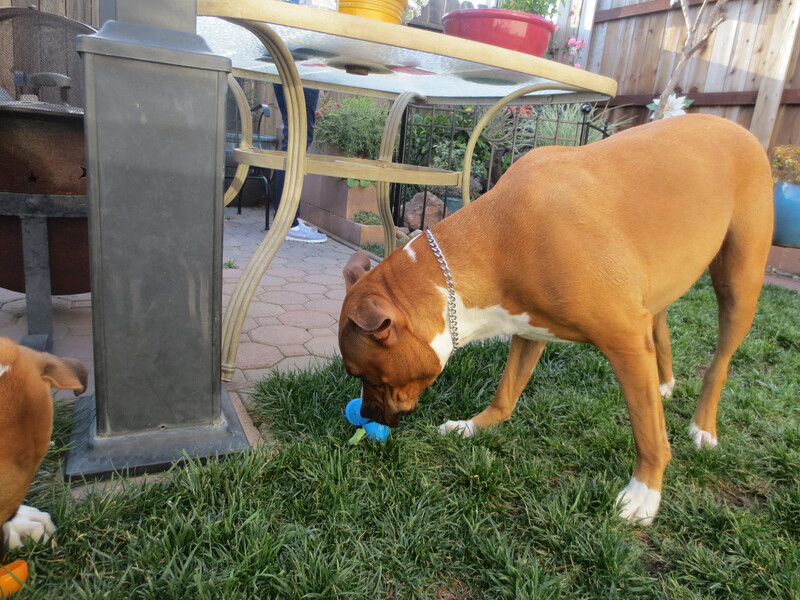 In fact, Simon and Rosee especially are quite good at opening the plastic eggs and fishing out the treat inside. We couldn’t help setting up our own hunt in our backyard. 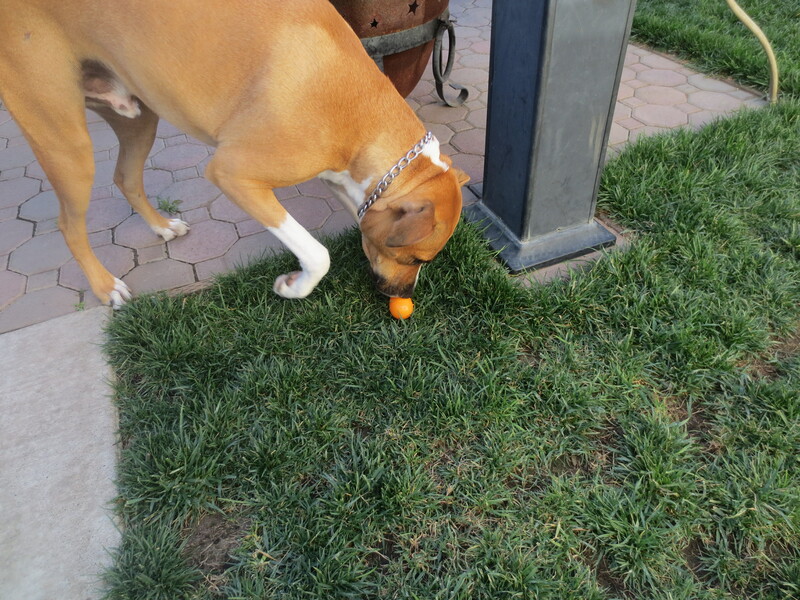 I particularly like to take the dogs on an egg hunt because it allows them to use their sniffers. Now, I know not everyone celebrates Easter and if you don’t then I wish you a very Happy Sunday. I hope it’s full of rest and relaxation! No one could ever accuse Simon of not bringing something to the table. Simon hates bathes. Simon loves water. Simon loves to spill his water bowls and get himself soaking wet. But Simon hates bathes. Go figure. About two summers ago when Rosee became a new and permanent fixture in my family’s life one thing became painstakingly clear. 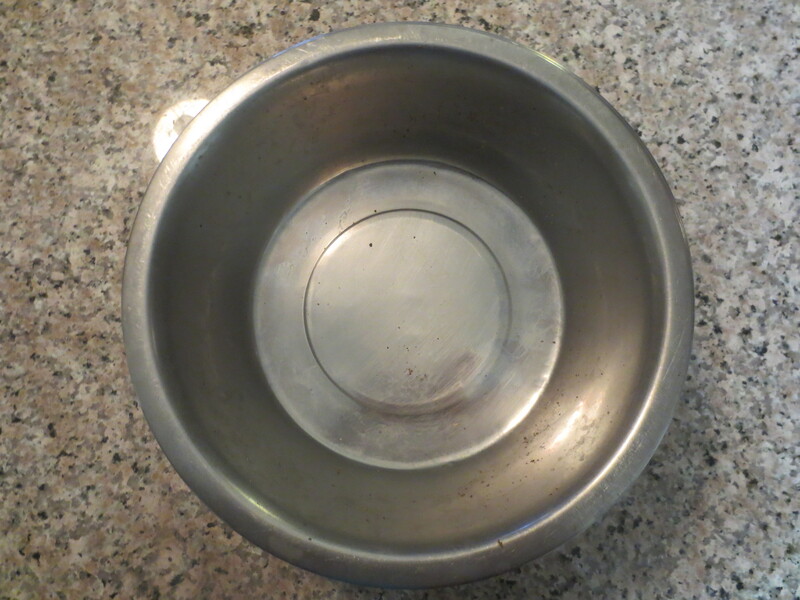 Two medium silver bowls (otherwise made for feeding) filled with water and left in the backyard for Simon and Rosee were not going to cut it. Even before the family adopted Rosee, Simon had started to make a habit of knocking over his water bowls because he much rather liked to play with his water than drink it. 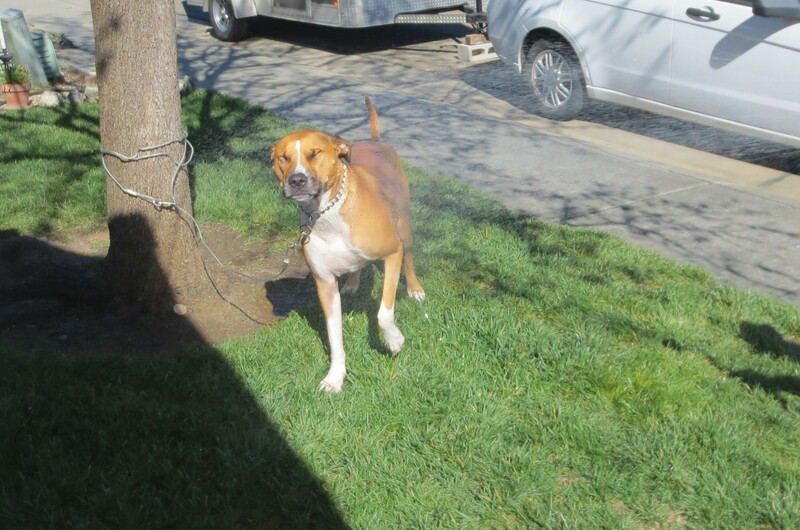 At the time we would often leave Simon safely secured in our backyard if we were only going to be gone for an hour or so, and every single time we returned we found him dripping wet and his two water bowls clear across the yard. 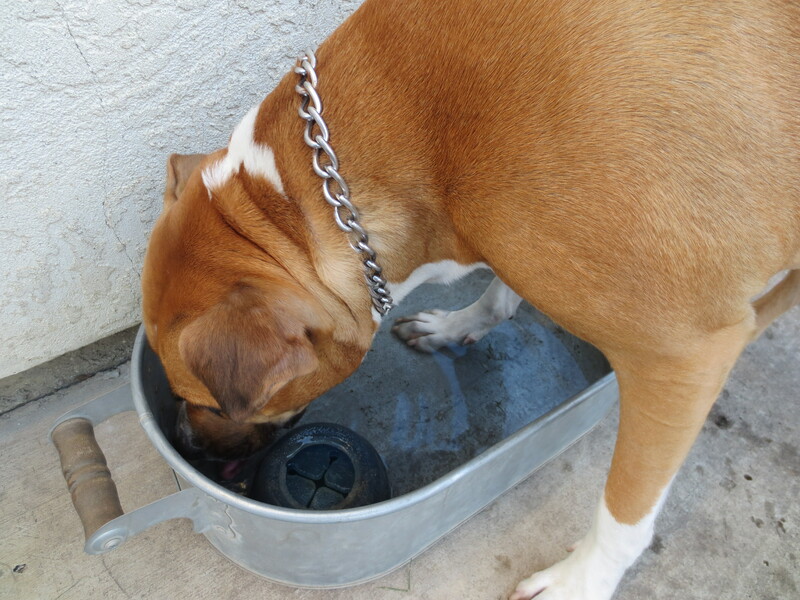 The silly boy was always super thirsty and would lap up a bowl of water once we refilled them, but every time we left him alone he would dump them nonetheless. Clearly, a solution was needed. It was summer and he couldn’t be without access to water, not to mention the amount of water we were wasting because of his escapades. A solution became even more paramount once we got Rosee and realized that the water bowls tipped over even faster than before. 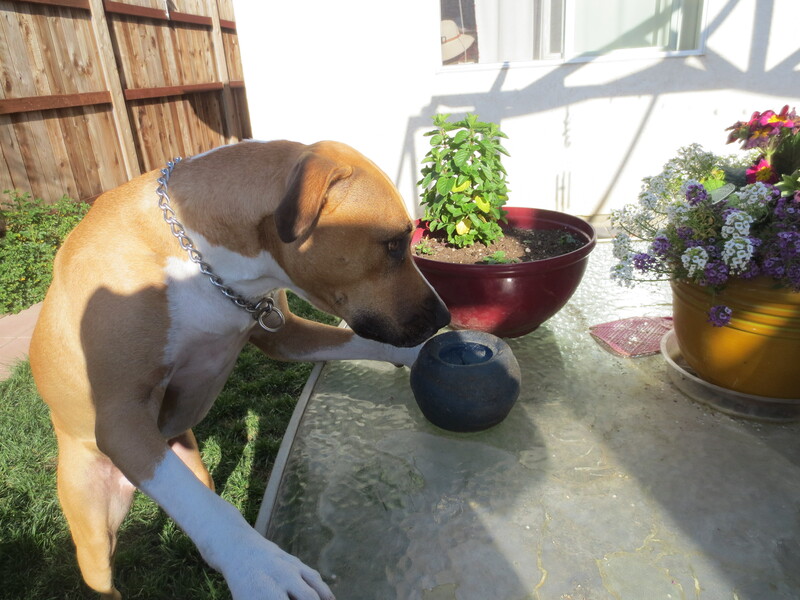 While Simon liked to play with the water, Rosee was more enamored with the bowls themselves (see Pawndered Thought March 9, 2015). So, off to the pet store we went. Unfortunately, the local pet stores offered few options besides slightly bigger water bowls. At one point my mother bought the dogs a stand (similar to this one), thinking that Simon and Rosee would leave the bowls be if they couldn’t get to them. Yeah. . . . it worked for about a day until the two decided ripping apart the plastic stand was more fun than running around after their water bowls. Water ended up all over them and the bowls were still used as playthings, along with that poor, poor stand. On with the search. 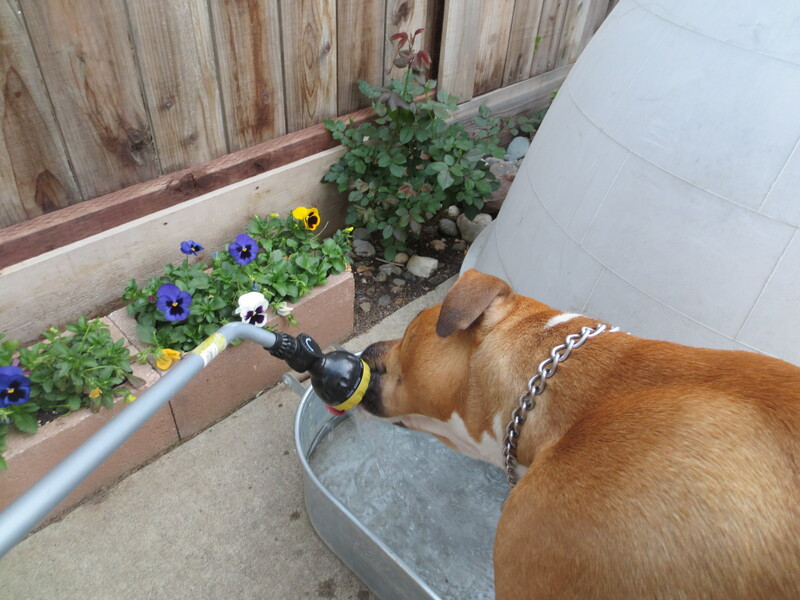 It wasn’t until my mother had dragged my sister Theresa and me to our local hardware and gardening store that I discovered gold, or at least the canine-water-bowl version of it. While perusing the planter aisle I came upon a simple oval grey planter that was about two feet long, one foot wide, and one foot deep. Now, I know what you all are thinking: It’s a planter! 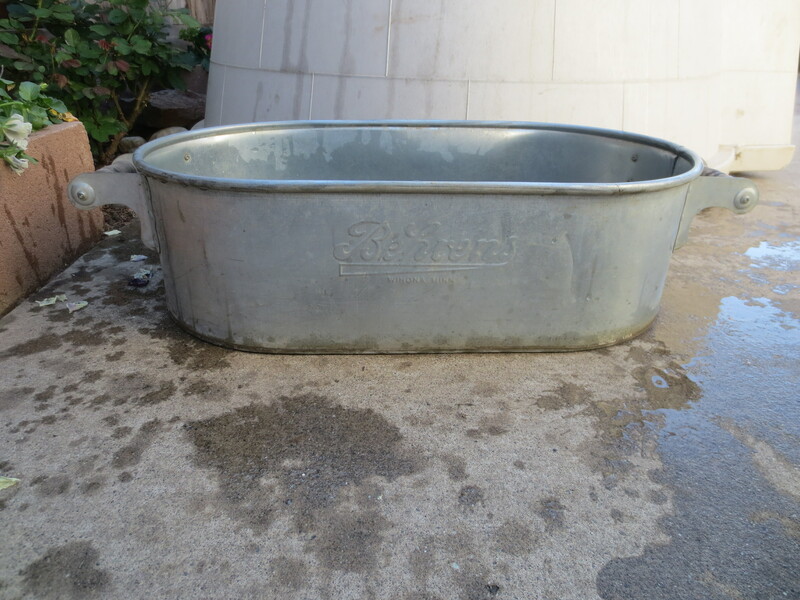 But it was also the perfect size for a dog’s water trough. 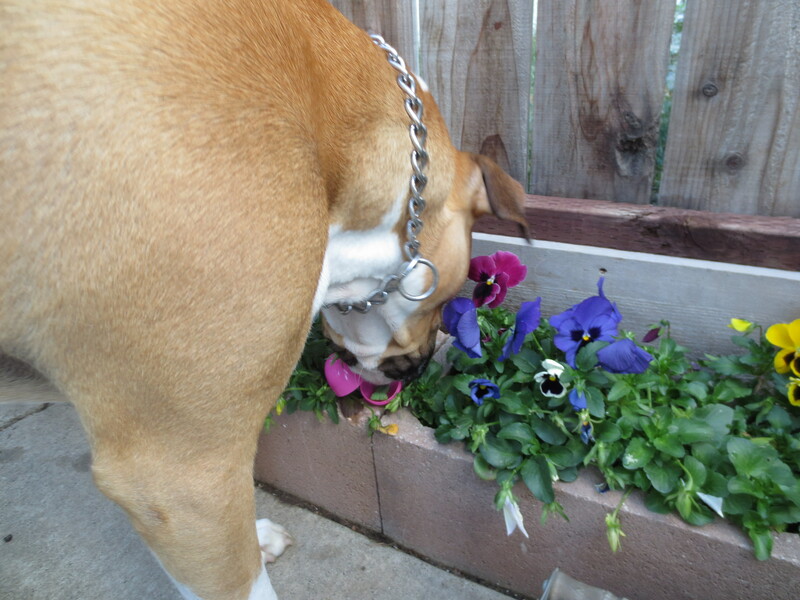 More specifically, this particular planter was the perfect size for two headstrong mutts to fit their heads in at the same time, and heavy enough when filled so that those same headstrong mutts could not flip it over or drag it around the backyard as a toy. The instant I discovered the trough I had a Goldilocks moment, ready to shout to the world “This one’s just right!” The trough was perfect, especially with its reasonable price of about $25, and has continued to be a great buy for Simon and Rosee and their rambunctious ways. Anytime Simon decides to make a mad dash for the trough, with or without his toy, he always manages to make it with his two front feet in the water and yet the thing never moves. Both square heads fit in the trough at the same time, making drinking water easy and comfortable. The trough also holds a large amount of water, important when you have dogs that like to drink their weight in water (seriously, Simon has to be told to stop sometimes). Though it gets heavy when full, the trough is still movable (by a human), easily contending with the roving sun throughout the day. All in all, the trough was an awesome buy that certainly gets a lot of use, making its introductory price totally worth it. The only problem (if you could even call if that) with the trough is that it has to be washed about once a month. 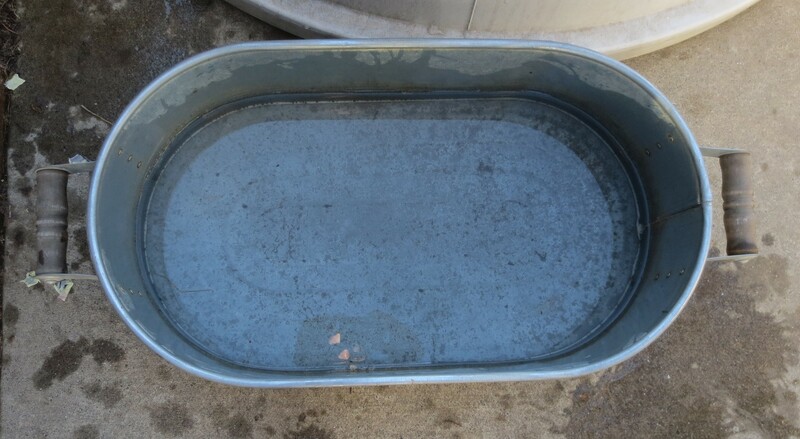 Because the trough does holding standing water it occasionally gets little green spots along the bottom, but these spots are easily taken care of with a little dish soap and a paper towel. 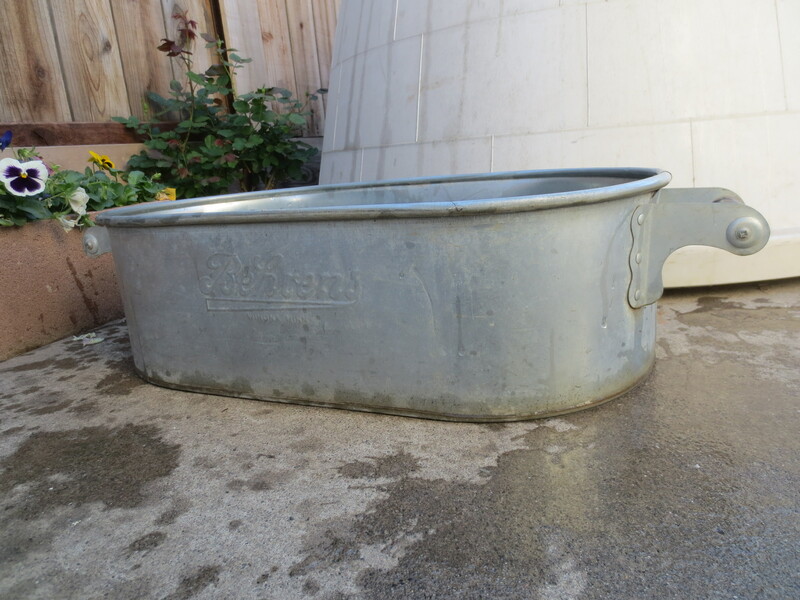 About once a month, otherwise as necessary, I’ll empty out the trough, give it a good scrub with aforementioned soap and towel, and rinse it out leaving it good as new. Simon and Rosee particularly enjoy the filling it up part, loving to drink straight from the nozzle. 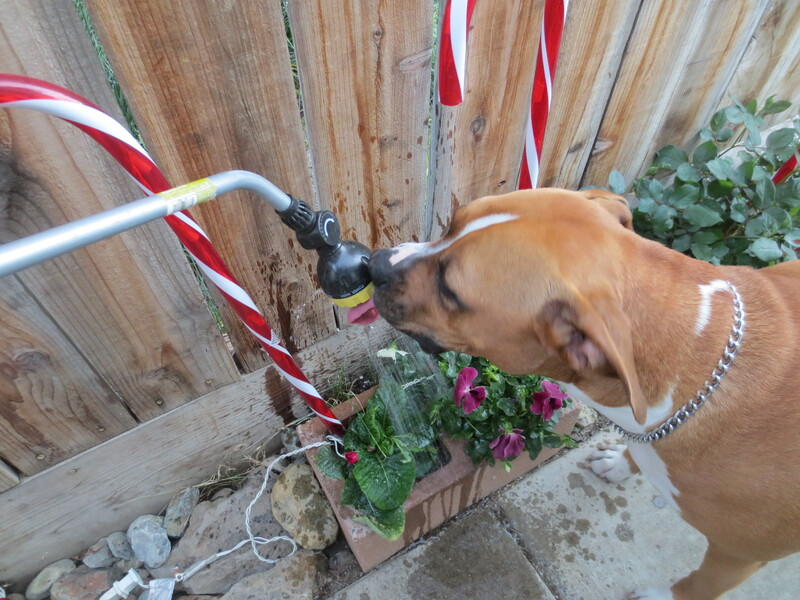 I guess they like their water best when aerated, such posh dogs! 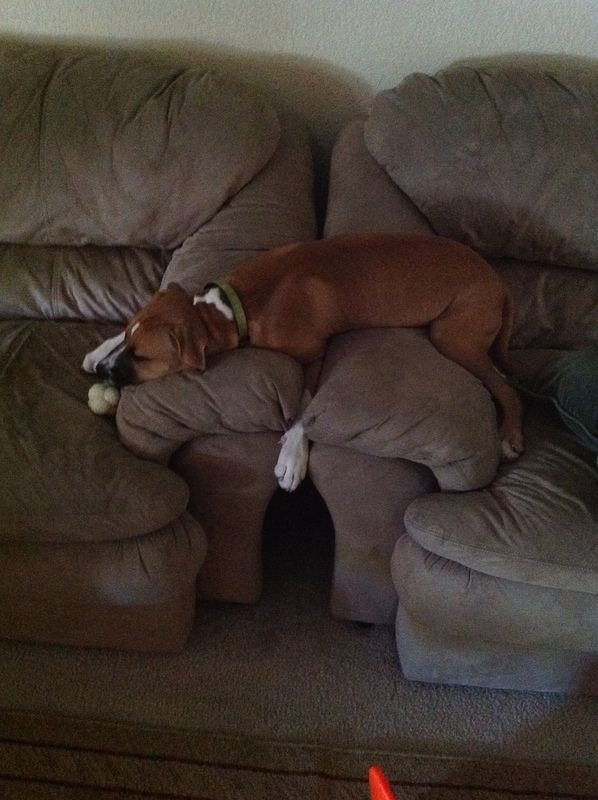 Point: get creative when it comes to finding necessities for your dog. Don’t just go to pet stores, but look around you at hardware stores, gardening stores, and anything else there is in order to find whatever it is that you need for your dog. If my mother hadn’t of dragged me with her to buy even more replacement flowers (because Rosee had already pulled up the ones originally planted with Simon as her willing accomplice) I never would have wandered down the planter aisle and found the trough that has faithfully served the dogs for the past two years. I would have had to continue dealing with wet dogs and scattered bowls, instead of knowing the peace I now have. Simon and Rosee would not have the comfort of always available water, even though they are no longer left outside alone (entirely different reasons apply). 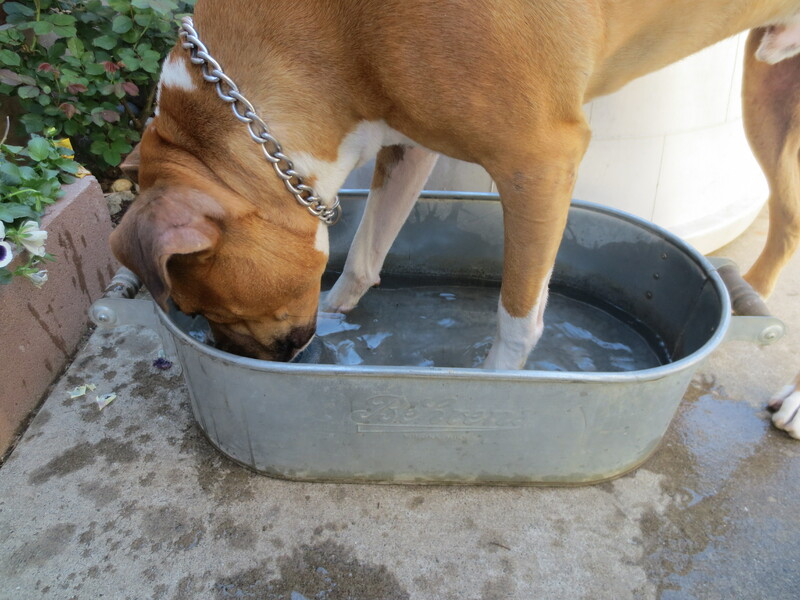 And above all, Simon would not have his own little pool in which to cool his feet and toy. His nose is currently stuck in the middle of his toy. Perhaps the water tastes better when lapped up through blue rubber. Simon has since learned that if he doesn’t want his ball picked up while he’s thirsty he should just take it to the water bowl with him. Wisdom better late than never I suppose. Powerful chewers. Lock-jaws. Aggressive chewers. All interesting ways to describe the jaws of my two product testers Simon and Rosee, yet they do not seem to capture the true essence of Simon and Rosee’s incessant need to chew. They both have strong jaws, I’m not going to deny that, but their love to chew goes beyond the level of might infused within their teeth. You see, Simon’s more of a nibbler. He nibbles. He nibbles on his toys to tease whoever is playing with him into trying to take it out from under him. He nibbles on the couch covers when he is lying down but still has too much pent up energy running through him to truly sit still. He nibbles on people’s clothes, while they are wearing them, when he wants you to pay him attention and he hasn’t yet graduated to whining or barking yet. If you haven’t caught on yet, Simon nibbles. Rosee, on the other hand, likes to chew and I mean seriously gnaw on things. She likes to put toys in the back part of her mouth, you know where those pesky molars are, are just go to town on toys. Of course, her favorites things to do this to are rubber-like toys, sticks and branches she can find at the park or beach, and hard bones that still have a little give. 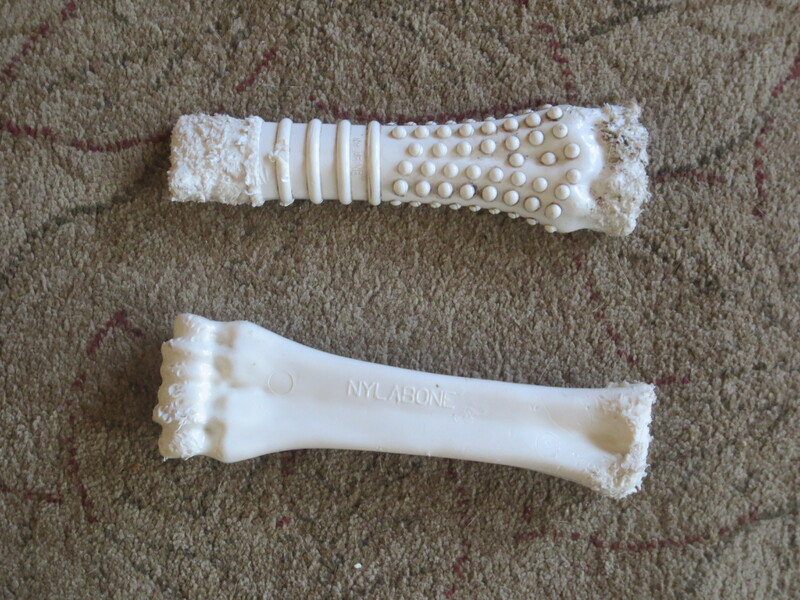 In any case, having two strong-mouthed dogs, yet with very different chewing patterns it has always been a chore to find bones that lasted more than twenty minutes in our household. Here to save the day: Nylabone! As you can see, these chews get plenty of action in our household. Nylabone has been the holy grail of bones in our household as this type of chew has lasted quite a few weeks of chewing between Simon and Rosee. 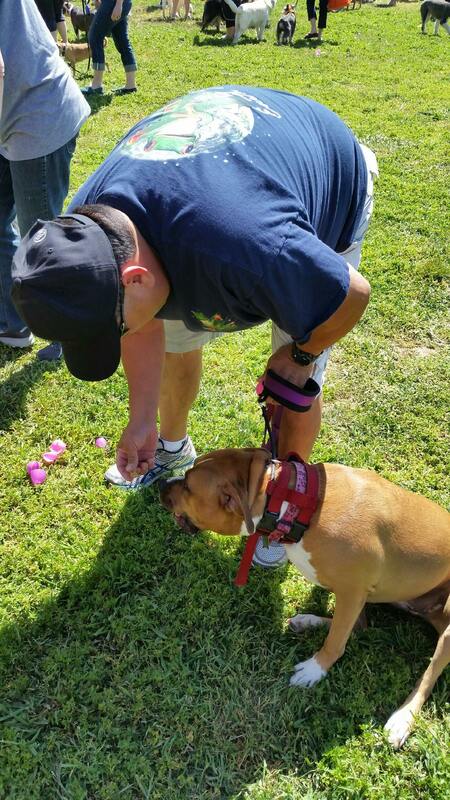 Now, Nylabone chews are made of nylon—what looks to me like a hard, plastic-like material—that you can find in various different shapes and flavors. Simon and Rosee’s favorites happen to be those that are shaped like twigs and taste like bacon, or the long white ones that taste like chicken. I can only go by the packaging for what the flavors are because I don’t necessarily smell the flavor wafting off of the bone, and it doesn’t leave a mess behind towards that respect. However, the shavings from the bones does tend to stick in our carpet, but I’d rather vacuum it up more often than have my dogs swallow so much of it. Either way, this one downside to the chewing of these bones does not detract from their usefulness. When I need something to distract Simon from whining at the back door, or something to get Rosee’s attention away from barking at the delivery truck next door, Nylabone chews work. 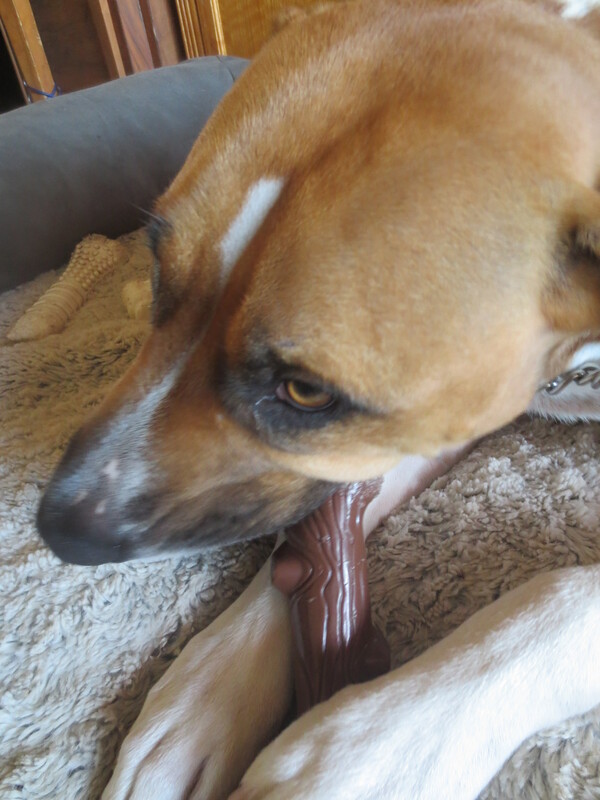 Simon and Rosee’s favorite type of Nylabone is called DuraChew, and as the website says this particular type of chew is made specifically for “powerful chewers.” And if it doesn’t get any better, their favorite DuraChew bone just happens to be called the Monster Bone. Though as I mentioned before, they are also partial to the brown branch-like bacon flavored bone and the long white chicken flavored bone. At this point in their lives I have amassed about five different types of Nylabone chews littering my living room floor. Aside from their favorites though, Nylabone has many different choices to choose from, many shapes and sizes to fit pretty much any dog’s likes. 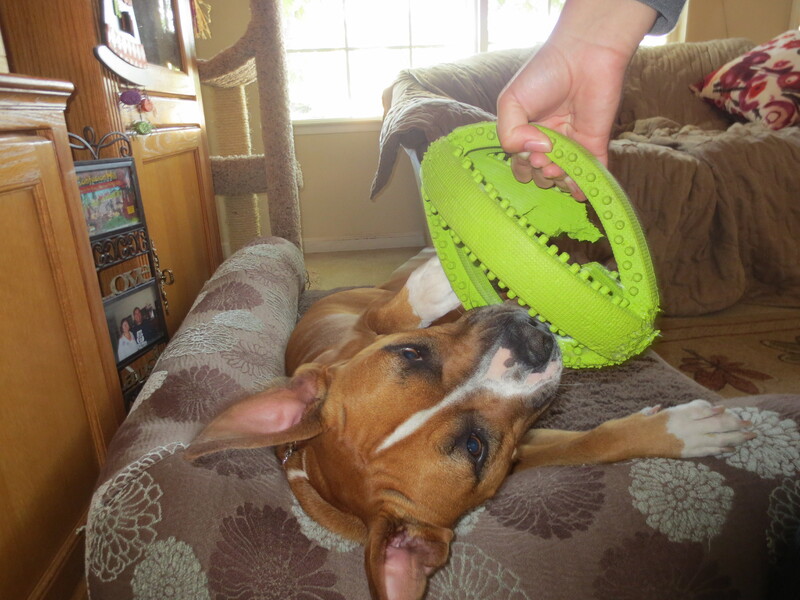 So, if your dog is anything like my two energetic balls of fur then give Nylabone a try. Now, please don’t take my high praises as proof these bones will rid you of all of your dog distraction problems, they are just bones. But they are bones that do not fall apart after being chewed on for one hour. They are not bones that my dogs can rip apart and eat completely. They are also not bones that are real and so act as an added source of food—but for my dogs’ sake this is a good thing because real bones really mess up their stomachs. Nylabone chews are good hard-material chewing instruments that allow my dogs the opportunity to have some fun, while taking it easy on my wallet since they last at least a few months, if not more, with moderate nightly chewing.